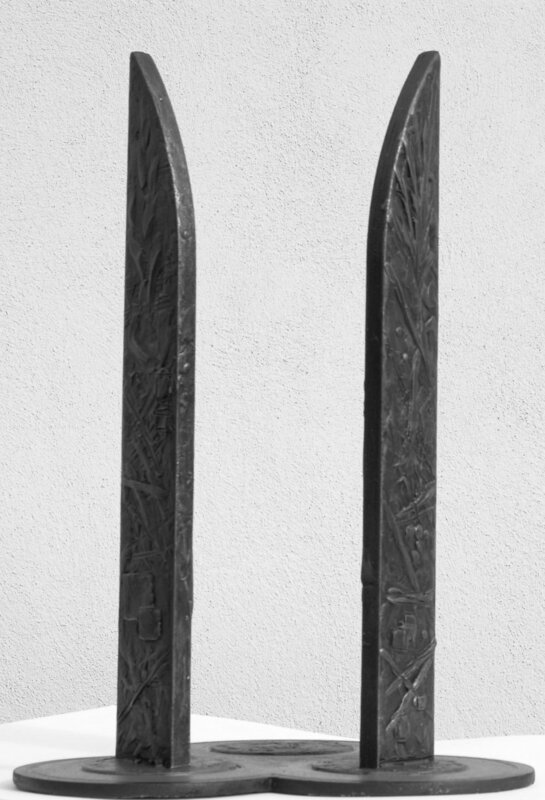 The bronze sculpture, is entitled ‘Better Together’, and takes the form of two 4.5m high doors. It’s strong visual presence frames the views of the Cathedrals and allows the viewer to walk between the ‘open doors’. Low relief press cuttings and other symbols from Bishop David and Archbishop Derek’s lives allow the audience to engage with the piece further. 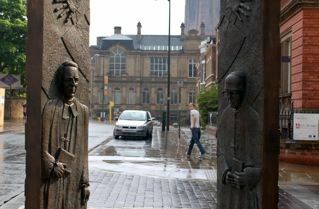 The sculpture was funded through public subscription, organised by the Liverpool Echo newspaper, it was unveiled by Bishop James Jones, Archbishop Patrick Kelly, Baptist Minister Phil Jump and Cllr Paul Clark, Lord Mayor of LIverpool on 11th May 2008. It was a golden day. But perhaps in the circumstances I should say a bronze one. The weather for the Walk of Faith on Pentecost Sunday was perfect. 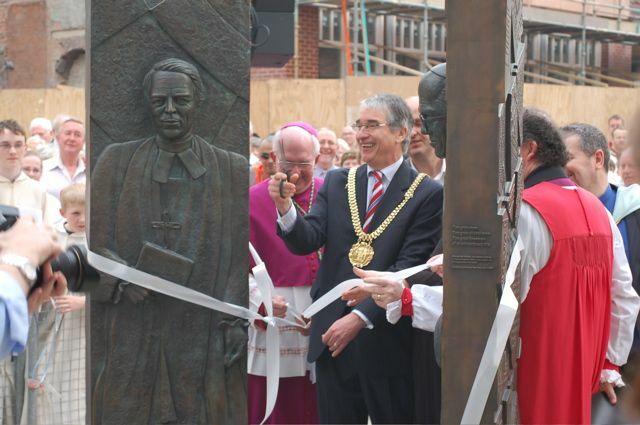 The long awaited bronze memorial to David and his colleague and friend Archbishop Derek was to be unveiled. Only that week I had photographed the hole in the road which was waiting in hope for the Stephen Broadbent sculpture to be put in place. Some weeks previously there had been a newspaper report giving the date of the unveiling so then I urged enquiring family and far off friends to book their tickets. And here they all were in force - even including my chief bridesmaid of 51 years ago who had come up from Sussex by train for the event. The two tall open bronze doors speak of welcome. They are always open to all who will come. There is a third circle which is empty except for the words Better Together and We meet in Hope. This circle invites each of us to step inside and join the company. The Sculpture speaks volumes of God’s ever open arms. Someone reminded me how unusual it is for a memorial to be set up during the lifetime of the spouse. This is a Liverpool statue for Liverpool people. Yet my family and I feel a huge sense of privilege that we were alive and able to witness such a day in this city, in the Capital of Culture Year. That the unveiling should happen in such a context felt just right. On behalf of the family I want to thank all those who had a hand in enabling this to happen. There are so many. Thank you to the Liverpool Echo for the original idea and to Catherine Jones who was the essence of patience and grace for so long during the years of gestation and saw it through; to the Echo’s readers, and all who contributed so generously and readily to the Appeal, including some who heard about it from further afield such as the Sussex County Cricket Club and others; to the Church Leaders from across the denominations for their patience in some frustrating delays and for their presence on the day; for those who wrote the liturgies with such care for the two services in each Cathedral at the beginning and end of the Walk; to all in the two Cathedrals for their welcome and hospitality to my family on the day; to Liverpool City Council for their support, especially Roger Morris who worked tirelessly and voluntarily behind the scenes; to the Lord Mayor, Councillor Paul Clark, for unveiling the statue; to the London Carriage Works for their patience while the hole in the road was being prepared, and for their hospitality; to Stephen Broadbent himself and to his team and family who have become firm friends. Stephen’s imagination and attention to detail, his tireless research and sensitivity, and his very great skill, have captured the essence of David and Derek and their relationship so wonderfully. He even included a cricket ball at David’s feet which delighted my grandsons. Maybe like the little mouse in our Cathedral which shines with the touch of children’s fingers down the decades, this little ball will come to shine with its own story. Wonder is the word. I am full of it. But this is not the beginning or the end. We can all continue the walk of faith in hope, in our own way, every day bridging divides in friendship and in the spirit of adventure, discovering more of the nature of God Himself in each other. What better time than now, in this special year in our city? Moving on and building bridges involves pain, but only if we cling to the past for too long. Thank you Stephen. Thank you everyone. Thank you Lord for good and faithful servants who became friends. The memorial is in Hope Street outside the London Carriage Works, which is close to the Philharmonic Hall. Looking through the open bronze doors in one direction gives a view of the Metropolitan Cathedral and in the opposite direction can be seen our Cathedral tower. Stephen Broadbent has produced a remarkable and great work of art. 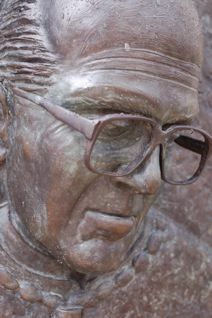 The life-size figures of Bishop David and Archbishop Derek are not up on a plinth out of reach, they are standing side by side on the street as they were so often during their ministry together. The two doors, which are 15 feet high, each stand on a circle and there is a third circle which enables the viewer to stand at eye level to the figures and appear to engage them in conversation. That third circle could, however, be imagined to contain the figure of Christ - unseen, yet ever present in their lives and partnership. On the other side of the doors and reaching right up to the top in low relief are press cuttings and other symbols from Bishop David and Archbishop Derek’s lives, making this a rare example of a memorial which can be read as well as simply viewed. Among and behind the press cuttings are textured panels and a woven background which symbolise how their lives were woven into the fabric of the City in the turbulent times of the 1970’s and 80’s. This is wonderful creativity through which Stephen has ensured that future generations will be able to see - and read - for themselves the contribution these two great men made to the City of Liverpool. The memorial took a year to create at Stephen’s Cheshire studio. After the concept and design were agreed, the first stage was to make a maquette. Then the basic shape of the doors was made in timber and the figures and faces were formed in soft wax which was then encased in plaster. 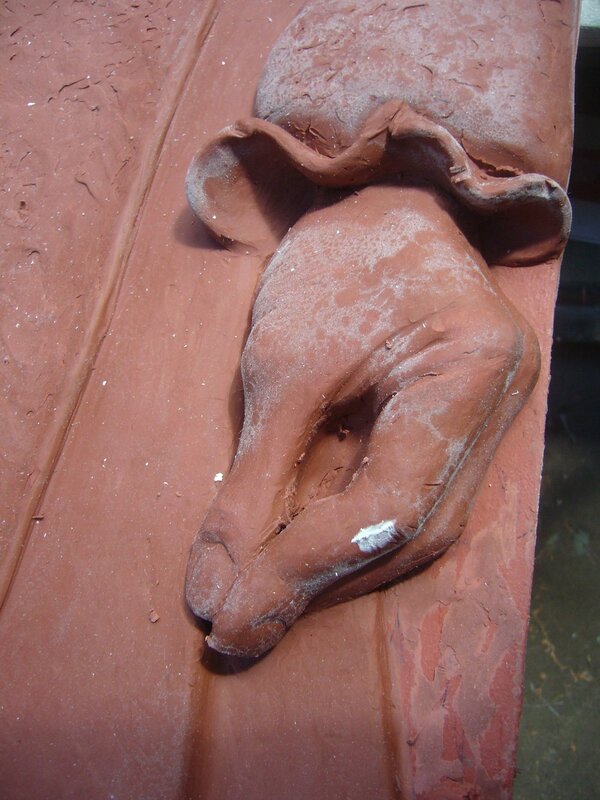 After the plaster was completely dry and set, the doors were fired in a kiln to melt the wax, leaving impressions of the plaster into which, at a foundry in Oswestry, molten bronze was poured to create the result we see today. The other side of the doors required a variation on that technique to preserve the detail of the lettering, but first it was necessary to spend a lot of time searching through the extensive archives of Archbishop Derek and Bishop David because Stephen wanted the memorial to tell the story of their whole lives. So, as well as many press articles relating to their time together in Liverpool, there are references to past parishes and Bishop David’s cricketing days. The press cuttings and other symbols were etched onto soft metal and then covered in wax and rubber before the wax was melted and the bronze casting carried out.